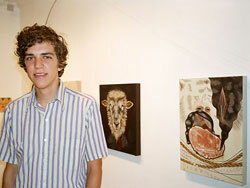 This talented young artist shows "White Hole" from 7/23-8/29 in San Francisco. So pleased to now have this Bay Area native's work up. Professional and talented, Henry killed it and to boot drew the most people we've ever had at an opening. Great work, sir... He starts his second year at SFAI in the fall. We'll be keeping you up to date on what this talented youngster is up to. The guy is something special. Didn't take long for our little gallery to fill and spill onto the street. First photos of the work and then photos from the fun opening after. Henry Gunderson in front of his work. Untitled - arcylic on panel - 30" x 24"
Vision Obstructed, Perception Clear - arcylic on panel - 19" x 24"
Sunken in Soil - arcylic on panel - 28" x 28"
Perishables - arcylic on panel - 36" x 36"
Hush - arcylic on panel - 22.5" x 22.5"
Precious Meat - arcylic on panel - 15" x 22"
Hope You Guess My Name - arcylic on panel - 18" x 20.75"
Panthera Tigris - arcylic on panel - 24" x 24"
End of the night sticker toss like back in those Slap days. Why is it 3:30am and why are we just getting to Dolores? !